Don’t make the mistakes we made! 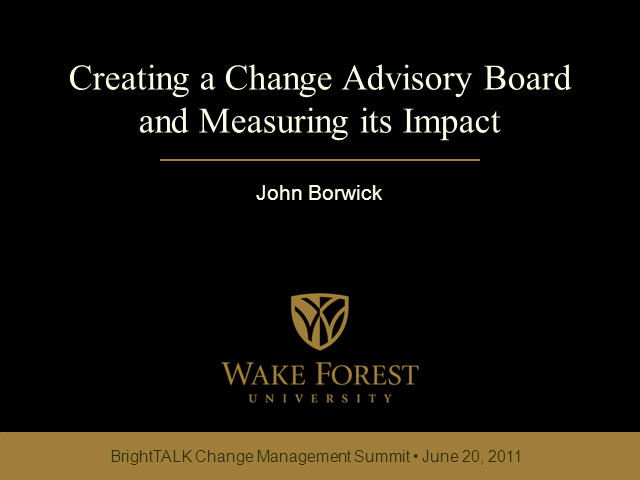 In 2008, Wake Forest University’s Information Systems department implemented a change management process centered around a Change Advisory Board that met daily to review all changes. The CAB was created to meet the interim CIO’s requirement for a formal change management process. In the subsequent months a department-wide change management process improvement identified many weaknesses in the original model and designed a more efficient, risk-based approach to change review and approval. This presentation will underscore the value of planning and review common pitfalls in change management implementation.